Lord Bingo News Bingo Promotions Ladbrokes Bingo Rolls Out The Red-Carpet! Ladbrokes Bingo Rolls Out The Red-Carpet! Ladbrokes Bingo is rolling out the red carpet to welcome new players to the site, with the timely launch of its brand new Guest Room. Players can also expect to be spoilt for choice with a tasty collection of holiday exclusives, juicy jackpots and bonus bonanzas! When you first roll up the Ladbrokes Bingo site, you’ll find they’ve pulled out all the stops to ease you into the adventure. As part of the homely welcome package, you can simply spend your first tenner to claim an awesome £30 Bonus. This means you can start to play with £40! They’ll also throw open the doors to give you access to their cozy new guest room. The room is open three times a day in hourly sessions and boasts a jam-packed collection of FREE bingo games, with wholesome prize pots waiting to explode. The guest room is designed to welcome new players to the experience, but is only open for the first seven days – so make sure you visit to catch the offers while you can! 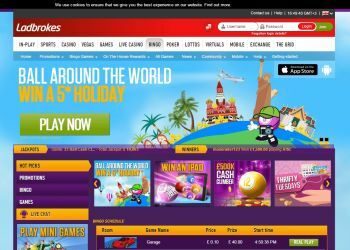 Ladbrokes Bingo is also full to the brim with a wall-to-wall collection of promos and holiday exclusives. You still have time until August 6th to Ball Around The World and snap up a jet-setting £5000 luxury 5* dream holiday! The exotic vacation will be worth £4000, and you’ll have the extra £1000 to spend on all your dream holiday purchases! To win, all you have to do is make sure you visit the Ladbrokes Bingo site daily to check out the different daily offers, from bonuses, free games and the holiday specials. You can also bag more chances to sip cocktails in the sun or lounge by the hotel pool, by playing to win one of two scorching £1000 holidays as runners-up prizes. If you manage to win, you’ll be rewarded with a £750 voucher, plus a cool £250 spending money – which you can choose spend on even more exotic holiday purchases! There are plenty of other bonuses up for grabs, such as the chance to win an Ipad and a £500K cash climber promotion. Ladbrokes Bingo will also treat you to a whole host of daily specials, weekly and monthly bonus treats, goodies and jackpot rewards during your stay!